The enjoyable Kiddie Coddles: The Goat with the Red Coat introduces the important lesson that siblings should be appreciated, no matter their differences. 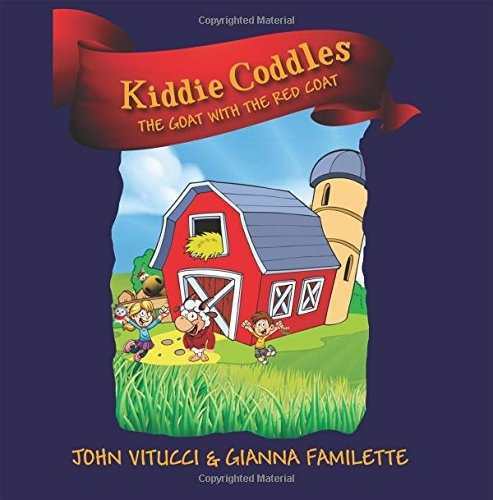 John Vitucci and Gianna Familette’s Kiddie Coddles: The Goat with the Red Coat is a tale that contains an age-old lesson about the importance of being kind. When Scarlett and her younger brother Jackson visit their grandparents’ farm, Scarlett makes fun of Jackson for being scared and crying. That’s when their grandfather gives them two mysterious gifts from the attic: a stuffed goat and a horn. He tells them the two items have been shared by brothers and sisters for generations, and that they are magical—but only if the two can work together to invoke the magic. The rest of the story follows Scarlett and Jackson as they discover that their grandfather was telling the truth. The goat, Kiddie Coddles, brings magic to the page. Jackson’s selfless wish that Kiddie give the animals magical abilities is charming. In keeping with her character, Scarlett selfishly wishes that Jackson was never born, spurring the lesson she must learn. That Kiddie grants her wish results in narrative satisfaction; when she sees what life would be like without him, she learns that Jackson is important to her, no matter how annoying he may seem. The tale runs long for a picture book, and young audiences might lose interest before it’s over. However, the story itself includes all of the necessary components to be satisfying. Characters are well rounded, vivid, and lively, and their story arcs bring them to where they need to be to grow. The book’s digital illustrations match the story, though they are mismatched among themselves. The inclusion of stock photos generates some confusion, with different portrayals of the same characters included sometimes mere pages apart.